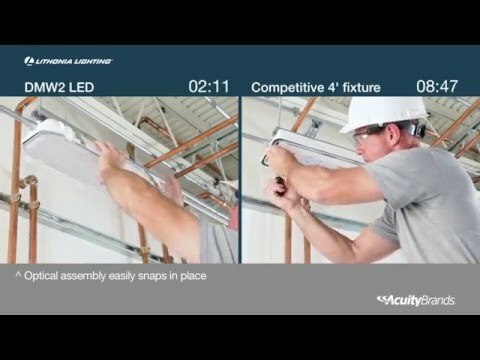 Building on our reputation for providing the “best value in lighting”, the DMW2 LED from Lithonia Lighting® is the most innovative wet location/vapor-tight luminaire on the market. Designed by the contractor, for the contractor — the DMW2 gives you all the performance of a traditional 4-foot fluorescent fixture in a smaller, low-profile design optimized for LED. Maximizing the benefits of LED technology, DMW2 LED provides versatility, higher on-task light levels and energy-saving controls options for demanding environments. Right out of the box, the DMW2 LED is ready for a wide array of applications including transit stations, food processing plants, awning/canopies, loading docks, car washes, garden centers, stairwells, parking garages and exterior environments where moisture or dust is a concern. Small in size. Big on benefits. Easy to install. Two-piece, snap-together design for simple one-person installation. Affordably priced. Price parity between LED and fluorescent has never been closer without sacrificing performance. Extreme adaptability. Choices for mounting, lens and an integral battery pack. Listings include: IP65 and IP66 rated; 1500 PSI hose-down; and rated for -40°F to 104°F ambient temperatures. Maintains wet location listing when wall mounted, too!